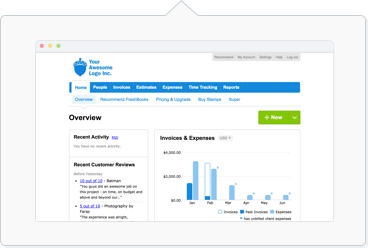 In 2017, we've added some new features and improvements to FreshBooks to help make running your business even easier. Looking for 2018? Click here instead. It's now easy to pause a Recurring Template to stop generating Invoices, or restart a paused template, with the click of a button. If you have multiple Businesses and you need one of them deleted, just ensure it's been cancelled first and then reach out to our Support to get it removed. Now you can create Proposals, which are detailed Estimates with rich text content, images, customizable sections and more. It's now easier to showcase the value you bring to prospective Clients. Tracking time is easier with an extension that lives in your Chrome browser. You can go across the web with the timer running in the background, and minimize or pop-out the timer. Quick start timer buttons have also been added to your favourite project management apps: Asana, Basecamp, Teamwork and Trello. Getting multiple and partial payments on an Invoice is now easier with Payment Schedules. Create a plan of when each payment is due without having to create multiple Invoices or continually editing an existing Invoice. The FreshBooks Mobile App for Android now supports the ability to edit Invoice and Estimate numbers, as well as adding line items with rates up to 4 decimal places. When selecting a country for your Company Profile or for a Client's profile, a Tax Number field will now appear if applicable to that country (e.g., VAT or ABN). Now you can add supporting documentation to your Proposals by adding attachments like contracts, agreements, floor plans and more. This makes it easier to highlight your value to prospective Clients. When accessing your account on the web browser, there's now a prompt to help you quickly download the FreshBooks Mobile App (for iOS or Android) if you haven't already. Credits can now be deleted from within the Available Credit area inside a Client's profile. When creating Recurring Templates, you can now add future unbilled time entries to it. This automatically pulls all available time entries whenever the Recurring Template generates an Invoice for you. You can now delete a Subcategory that you've created. Expenses assigned to a deleted Subcategory will automatically be reassigned to the parent Category instead. When scrolling up on any page inside FreshBooks, the headers will shrink and stick at the top, making it easier to know right away which page or columns you're looking at. Whenever you want to share an Invoice without sending it by email, you can Create a Shareable Link instead. This automatically marks an Invoice as Sent and generates a link that you can then share with your Client or team member outside of FreshBooks. Now you can create and share PDFs while using the FreshBooks Mobile App for Android. While viewing an Invoice on mobile, the full description of every line item will now be visible. The search bar is now available in the Projects section so you can find specific Projects quickly. FAQ articles are now just a click away with the new Help Widget. Just tap on the blue question mark ? icon in the bottom right to start searching. Receipt attachments are now visible on the iOS app when viewing Invoices. When generating an Invoice from tracked time, Time Entries will be sorted chronologically on the Invoice for you automatically. Employees can now log in on the FreshBooks Mobile App for iOS, making it easier to manage businesses while on the go. Now you can search for multiple terms in any search field. For example, type in your Client's name and the word Draft to view all Draft Invoices for that particular Client. Finding a particular Project is easier now that you can sort by Project Name or End Date. Click on either of these headers to organize the list. We've now increased the number of items per list from 15 to 30, making it easier to view more content on a single page. When using the FreshBooks Mobile App for Android, a detailed loading screen is now available, along with the ability to view your Notifications and correspond with your Clients on Estimates. Whenever you call our Support team, press CTRL + ALT + K on your keyboard while accessing your account to quickly find your Support Key. Improvements have been made to easily ensure your Recurring Templates are enabled for Recurring Payments during creation. You're also able to see the transaction fee information during set up as well. Assigning Services to Projects is now possible, as well as designating different Rates for each Service. This will allow you to bill more accurately for your time. From the Invoices section, you can now open any invoice in a new browser tab on your browser window for those who like to work across several invoices simultaneously. You can now add discounts to your Recurring Templates, making it easier to reward prompt clients or encourage loyalty for using your services. Viewing Recurring Templates will now show the Client's Company Name by default instead of the Client's First and Last Name, making it consistent with the view in the Invoices section. Corresponding with your Clients on Estimates is now possible on the FreshBooks Mobile App for iOS. You'll also be alerted via our Notifications on the web whenever a Client accepts or sends in a message on any Estimate. Now you can dig deeper in certain reports by clicking on any link in it, like Clients and Projects on the Time Entry Details report. Right-clicking is now supported so you can open Invoices, Estimates, Expenses and Projects in new browser tabs to easily multi-task. Auto-Paid, Auto-Sent and Auto-Draft statuses have now been added to quickly identify which Recurring Template has saved payment information via Recurring Payments. Click on any blue date next to any Recurring Template to see all Invoices generated by that Template. You can now archive Invoices, Clients and Expenses to keep your lists organized. To view archived data, click on the View Archived button at the bottom of the list. Easily switch between FreshBooks accounts for your different businesses from your Android using the FreshBooks Mobile App for Android. Just tap your avatar in the top-left to switch or read more here. It's never been easier to ensure you’re on the same page as your client before work begins. Now you can create and send Estimates to your Clients from the FreshBooks Mobile App for iOS. Now you're able to send Invoices to multiple people in an organization or company by adding them as secondary contacts. These contacts' emails will automatically be added along with the primary Client's email every time you send out an Invoice. Get approval before work begins. You can now create and send Estimates to your Clients from the Android app. When rebilling expenses, you're now able to include the receipt attachment on the Invoice. Improvements have been made so you can easily chat with your clients on the Estimate itself to make sure you're both aligned on the work, before it's begun. Now you can quickly search for certain Recurring Templates and filter the list of Recurring Templates by a specific column header. Estimates can now be duplicated easily. Just check the box off, click on the Actions button and select Duplicate. Sharing websites and links with your Clients is now possible. Live links (URLs) are supported in the Notes and Terms sections on both Invoices and Estimates. Any completed Projects can now be marked as Archived to keep your list of Projects organized. To view Archived Projects, click on the View Archived Projects button at the bottom of the list. It's now easy to save your Invoices and Estimates as PDF files. Just click on the More Actions button and choose the Download PDF option. For international users or those who go by a different date format, you can now choose one of three options. It's easier than ever to get a detailed overview of your client's payments on Invoices thanks to the Payments Collected report. You can filter by time period, clients, payment method and currency to generate the exact report you need. Rates have been updated so you can assign a billing rate to each Team Member or to each Project. Now you can create Recurring Expenses for payments that you make on a frequent basis. Just set up the Recurring Expense with the start date, frequency and number of generated Expenses, and watch them generate automatically. Improvements have been made to make it easier to search for Estimates. Now it's simple to find that one specific estimate you're looking for. Save even more time by converting your Estimate into an Invoice. You no longer need to re-enter details from the Estimate onto an Invoice - just convert, send and get paid. Now your client can accept the Estimates you send them. Once they click the Accept button you can begin your work confidently, knowing you and your client are on the same page. Never miss another billable minute. Now you can start a timer directly from the FreshBooks Mobile App for iOS so you always have an accurate log of the time you worked. With Estimates you can make sure you’re on the same page as your client before work begins. It’s easy to create an overview of your work with the expected price and send it to your client. Never miss another billable minute. Now you can start a timer directly from the FreshBooks Mobile App for Android so you always have an accurate log of the time you worked. Now, you can set a general default rate or a flat rate for tracked time. What’s more, you can set specific default rates on a project-by-project basis. When you’re ready to bill for your time, the correct rate is automatically pulled onto the Invoice, making billing for your time faster than ever. When generating an Invoice, you can now pick exactly which projects you want to bill for as well specify the time frame. So now it’s even easier to format your Invoice exactly the way you’d like. You can now add unbilled time to an existing Invoice instead of creating a brand new one. Perfect for times when you want to update an unpaid Invoice with newly completed work. When using the timer to keep track of your hours, you can now edit the start time. Perfect for those times you forgot to start the timer as you began working. You can even set the start time to the future to start a countdown. You can rest assured that the right people are receiving your Invoices when you’re using the FreshBooks Mobile App on your Android device. Now you can send your Invoices to multiple recipients from the app. From the Project page, you can now generate an Invoice for the time tracked towards that project. So, if you bill differently for different projects, it’s now simpler to create project-specific Invoices. The Profit and Loss report now separates expenses by subcategory, so you can get a detailed breakdown of your spending. Plus you can specify certain subcategories as costs of goods sold, so they are deducted from your profit. When you connect a bank account or credit card to automatically import expenses, you can now select a specific start date for the initial import. This makes it easier to avoid duplicate expenses. Help keep your team on track by setting a time budget. From the Projects page, it’s now easy to see exactly who has been logging hours towards a specific project, how many hours have been logged and how close to budget you are. Recurring Payments are the fastest way to get paid. Now, when you set up a recurring Invoice with online payments enabled, your client can save their credit card details to be automatically charged every time an Invoice is generated. It’s easier than ever to get a detailed overview of the time you and your team have logged thanks to the Time Entry Details report. You can filter by time period, team member, client and status to generate the exact report you need. From the FreshBooks Mobile App on your Android device, you can now view a list of all the payments made towards your Invoices and edit them if required. Time entries logged by you or your employees can now be manually marked as billed. This will prevent them being pulled onto any future Invoices you create. Create custom subcategories for your expenses. Now, it’s even easier to keep everything organized just the way you like it. Now, you can get a weekly view of your logged hours and log new hours from that view, making it even easier to add a week’s worth of hours at once. All of your business reports are now easily accessible from the bottom of your dashboard, without any extra clicks. Easily switch between FreshBooks accounts for your different businesses from your iPhone or iPad using the FreshBooks Mobile App. Just tap your avatar in the top-left to switch or read more here. Assign your projects to specific clients or mark them as an Internal project. Now you can easily search for time entries from either the Track or Review sections. When you generate an Invoice from time you’ve tracked, you can now customize how that time shows up. You can also adjust which details you’d like to include and how you’d like the entries to be grouped. The total profit chart on the dashboard has been updated to more clearly represent your business’ profit. It no longer includes sales tax in the total. You can now see the time your contractors are logging from within your account. Just head to the Review section within Time Tracking.